Checkout Date & Times: If picking up Please pick up your lots within 10 days of the auction ending. NO PICKUPS ON AUCTION DAY FOR ONLINE BIDDING. Invoices will be ready for pickup on the Monday following the auction after 12:00pm. Vintage Structo Blue Ready Mix Concrete Truck. Nice original paint, pressed steel 15" long. 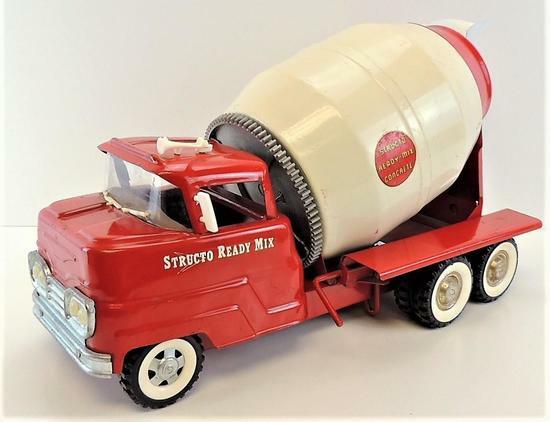 Vintage Structo Copper Ready Mix Concrete Truck. Nice original paint, pressed steel 21" long. Vintage Structo Toys Live Action Cab & Trailer. Nice original paint, pressed steel 11" Cab & 18" Trailer. Vintage Structo Double H Red Livestock Truck. Vintage Structo Green Hydraulic Dumper. Nice original paint, pressed steel 13.5" long. Vintage Structo Wrecker Truck Freedom 7 No.1. Nice original paint pressed steel 13" long. You've been outbid to t****-! to YOU! Vintage Hydraulic Snorkel Truck Power & Light. Nice original paint, pressed steel Green & Yellow 17" long. Vintage SSS International Friction Dump Truck #649. Nice original paint, pressed steel toy Made in Japan Blue & Red Cab 10" Dump 16.5". Missing connector post. Vintage Structo Hydraulic Fire Truck Hook & Ladder. Nice original paint, pressed steel 33" long. Vintage Nylint Aerial Hook-n-Ladder Truck. Nice original paint, pressed steel 34" long. Vintage Structo Pressed Steel Hook & Ladder. Nice original paint, still in original box. 29" long. Vintage Structo Typhoon Fire Rescue Truck by ERTL. Nice original paint, pressed steel 13" long. Vintage Structo SFD Fire Engine Hook & Ladder Truck. Nice original paint pressed steel 29" long. Vintage Structo Chrome C-3044 Semi Cab. Nice original paint, pressed steel 8.75" long. Lot of (2) Vintage Structo Semi Truck Cabs. Nice original paint, pressed steel (1) Dispatch 10" (2) 8.5". Vintage Structo Tractor Scraper / Dozer. Vintage Structo Construction Company Steam Shovel Bucket. Nice original paint, pressed steel yellow 25" long with bucket extended. Vintage Nylint Michigan T-24 Clam Crane Truck. Nice original paint, pressed steel 30" long. Vintage Structo Transport Semi Trailer. Nice original paint, pressed steel yellow 16" long. Vintage ERTL Livestock Van Trailer. Nice original paint, pressed steel 16" long. Vintage Structo Hydraulic 10 Wheel Dump Truck. Nice original paint, pressed steel, cracked windshield, 13" long. Vintage Tonka Transport Car Hauler. Nice original paint, pressed steel one headlight missing 18.5" long. Nice original paint, pressed steel orange cab 13" long. Nice original paint pressed steel missing exhaust 11" long.